Quickie post! Because I know some of you have to be in the same boat I am with Easter candy. You see, every year, we get Easter baskets. They are filled with, among other things, an absurd amount of candy. We don’t need to eat this candy. But we do anyway. So why not make it fun. I feel like you can do one of two things with this idea. 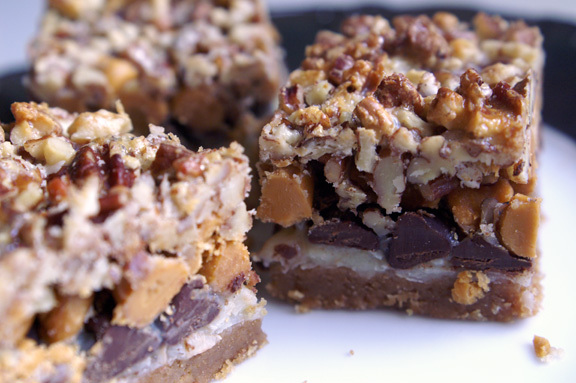 You could either 1) intercept any Easter candy which enters your house and make this bark after Easter, or 2) buy some Easter candy ahead of time and make it for Easter. I’m doing the latter, because I’m having people over, and this is a nice alternative to the seemingly required basket full of candy. First, the candy. I picked up some retro little Sixlets at the store along with some smaller chocolate-covered marshmallow bunnies. You can use anything you want; there’s lots of candy out there that would work. Pastel M&M’s, Whoppers Eggs, Peeps, whatever. You could even get a giant chocolate bunny and chop it up. Whatever floats your boat. 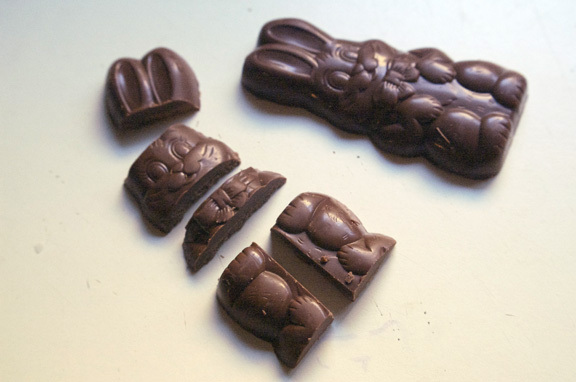 Make sure if your bunnies are on the big side, you chop them up into smallish pieces so you don’t have clumpy bark and the different types of candy end up evenly disbursed. Next, the bark base. I use a good white baking chocolate because I wanted a lighter flavor and I wanted the chocolate bunnies to stand out. White chocolate seemed to contrast really well with the selection of candies I saw, which are predominantly made of milk or dark chocolate. 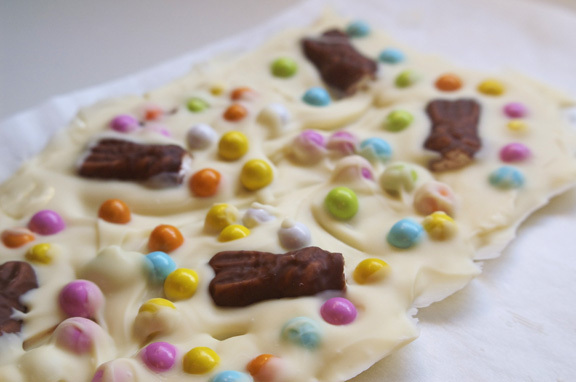 To make the bark, all you need to do is melt your white chocolate, pour it into a pan, cut up your bunnies and sprinkle your candies, swirl it around a bit, and pop into the fridge. in 2-3 hours, it’ll be set and ready for breaking up and putting out into baskets. Cute, right? and all you need to do is break it with your hands. 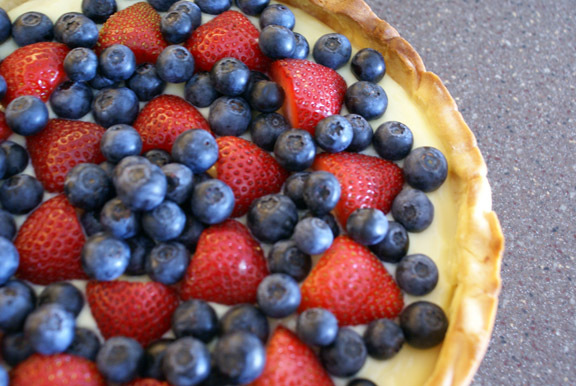 Try to do small pieces, so people can eat it a section at a time without it melting. If you want to use a knife, be my guest; I used a chef’s knife when I got near the marshmallow bunnies, just to give them a clean edge. So there you go: my virtual Easter basket to you. The recipe below will make about a quarter sheet pan of bark. Be sure to line the pan the way I tell you to avoid the bark sticking…it makes it way easier to work with. Adapted from my imagination, which I’ve been told is a scary place. And my weird ideas on how to eat Easter candy. Remember; the yield on this is one-quarter sheet pan. If you’re using a larger pan, either buy more white chocolate and use more candy, or scoot your melted bark towards the center of the sheet. it’s easy to keep it in one place if you begin by pouring it centrally on the sheet and spreading it our from there. Ultimately, your bark should end up to be about a quarter of an inch or so thick. Line a lipped quarter sheet pan with foil, being sure to get foil up and over the sides. Line the bottom of the pan with a sheet of parchment paper. Let’s get your candy prepared. 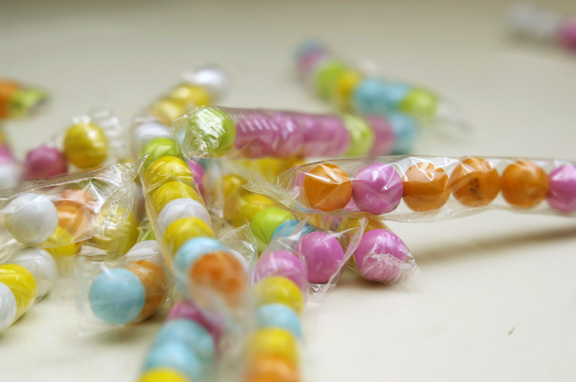 If you have little egg-shaped candy, remove them from their packages and place them in a bowl. If you have bunnies to cut up, do so, trying to keep your pieces on the small side, no more than 1 inch in length or width; you don’t want giant chunks in your bark. Once your candy is ready, begin to melt your chocolate. Please don’t microwave your chocolate to melt it. I’m basically begging you. It’s just as easy to use a double boiler. 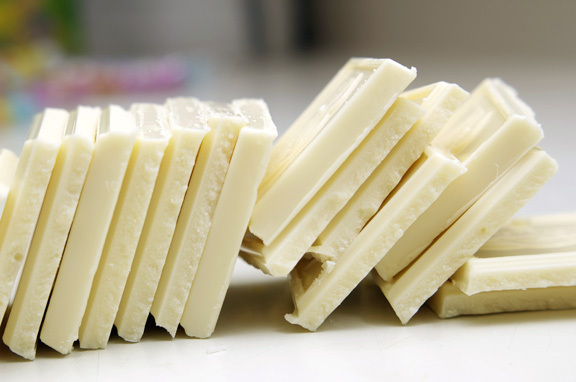 * Using a double boiler, melt your white chocolate over medium-low heat, stirring frequently. When completely melted, remove the chocolate from the heat and set aside to cool just slightly. Pour the melted white chocolate towards the center of the prepared pan, spreading out from the middle to get the desired thickness. 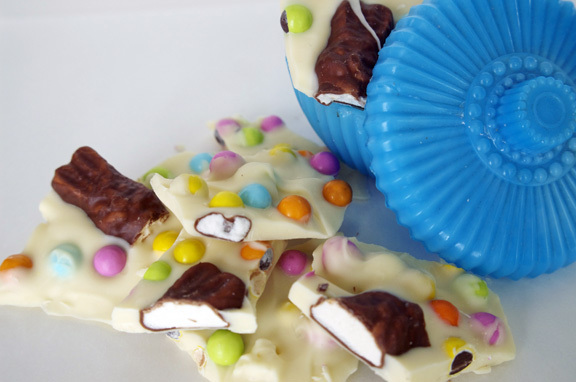 Grab your prepared easter candy and place it around the bark evenly, pressing it in to the liquid chocolate as you go. I did my bunny parts first, then sprinkled the egg candies around it. 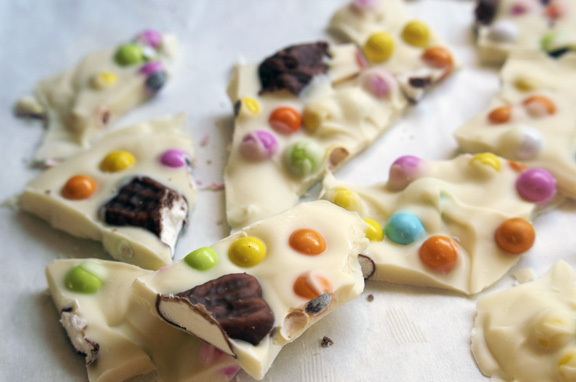 Remember, it doesn’t have to be perfect; chocolate bark has a way of looking really great once it’s broken up. If you want, swirl it around a little using a butter knife. This is optional, but if you feel like your bark would benefit from a little swirl, go right ahead. It helps to incorporate some of the bigger pieces, if you have any, and it gives it a little depth by covering up some of the candies in the white chocolate. Scooch (that’s a technical term) the sides in to make an even edge (if it’s smaller than the pan) with a spatula so you don’t have any straggler chocolate. Place in the refrigerator where it won’t be disturbed for at least 2-3 hours to set up. Break up your bark, using your hands, into smallish pieces. Like I said above, if you want to use a chef’s knife to break it up, that works also, especially if your candy has soft insides (like my marshmallow bunnies) that you want to give a nice clean edge to. 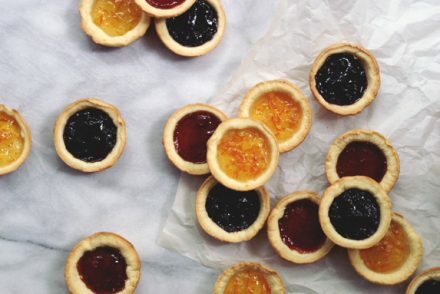 Serve in easter baskets or something equally cute. *hey, don’t know how to double boil? Here’s what you do. get a heatproof bowl (a glass Pyrex bowl works very well) or an actual double boiler and set it over a saucepan of barely simmering water, being sure the top bowl does NOT touch the water below. Stir frequently, and you should see your chocolate gradually melt and get smooth. at this point, remove the chocolate bowl from the bottom saucepan and set aside. Oh boy, sad beheaded bunnies made happy again! emma, i completely get it: there are white chocolate lovers and haters out there, and i understand both sides. And thank you! i love that bowl too…one of my thrift store finds. people get rid of the coolest things. I have a small (HUGE) obsession with those chocolate-covered marshmallow bunnies you’ve got going on in that bark. I may or may not hoard those things come Easter season. OR, the marshmallow Santas that come out at Christmas. Anywho, I notice you say that you’re having company for Easter. And that you’re handing this bark out as a gift. I’m hoping I’m on the invite list, and that you save me a piece of bark with the marshmallow bunny in it. chocolate covered marshmallow shapes are sooooo good, i agree! i feel like there are also marshmallow jackolanterns which come out for halloween, if you want to plan the hoarding around that. you know, if you and your wife made the trip up here just for my easter brunch, i’d make you a whole bunny bark basket. filled with marshmallow bunny heads. AND bodies. This is too fun! I’m loving the combo of colors, flavors, and textures. Since I have no sweet treats planned for Easter, I think I’ll make a batch of your wild and crazy bark. And my bark will definitely have Sixlets. Sixlets! I went through tubes of them as a kid. i’m so happy someone recognized my sixlets/enjoyed them as a kid too! i was happy i found them in the store. ha! sounds like you had quite the racket going on when you were a kid. 🙂 did you see the Serious Eats post about cadbury egg salad sandwiches? totally cute AND what seems like a cadbury egg fan’s version of heaven. I did see those sandwiches, but I wish that I hadn’t. Fun concept, but I can’t stand egg salad. Cream Eggs deserve SO MUCH BETTER than being turned into egg salad! 😛 Gotta love CakeSpy and her endless creativity. She makes fun things. I made her Chocolate Ice Cream pie for St. Patricks Day, and it was so good. Kevin, who doesn’t even eat chocolate, couldn’t get enough! I think that’s just because it was pie. The guy loves pie. thank you, thank you, thank you! bunny bark is like the naomi campbell of bark, however; very photogenic, i did almost no work. it won’t throw cell phones at you, though. Oh my gosh this is adorable. I love the use of all that candy. Would be a great use for leftover candy for sure.